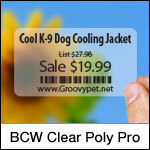 The BCW Clear Poly Pro is an acrylic top coated polypropylene facestock with a permanent all temperature adhesive. Ideal for thermal transfer applications that require outstanding print quality and unparalleled smear and scratch resistance. Recommended for use in a wide variety of applications, including shelf and product labels.Use with BCW Wax/Resin ribbon. Compatible with TSC, Zebra and Datamax industrial printers. 2.25" x 1.25" clear polypropylene thermal transfer label on a 3" x 8" core. 3500 labels per roll / 4 rolls per case. BCW Clear Poly Pro 2363125 special features - Perforated. Use with BCW Wax/Resin Ribbon. 2.50" x 2.00" clear polypropylene thermal transfer label on a 3" x 8" core. 2300 labels per roll / 4 rolls per case. BCW Clear Poly Pro 2364200 special features - Perforated. Use with BCW Wax/Resin Ribbon. 4.00" x 1.00" clear polypropylene thermal transfer label on a 3" x 8" core. 4300 labels per roll / 4 rolls per case. BCW Clear Poly Pro 2367100 special features - Perforated. Use with BCW Wax/Resin Ribbon. 4.00" x 2.00" clear polypropylene thermal transfer label on a 3" x 8" core. 2300 labels per roll / 4 rolls per case. BCW Clear Poly Pro 2367200 special features - Perforated. Use with BCW Wax/Resin Ribbon. 4.00" x 3.00" clear polypropylene thermal transfer label on a 3" x 8" core. 1550 labels per roll / 4 rolls per case. BCW Clear Poly Pro 2367300 special features - Perforated. Use with BCW Wax/Resin Ribbon.